A performance fleece jacket with a heathered, casual style, the Covert Cardigan is the go to piece for daily adventure. Alpine inspired and highly functional, the jacket has clean lines and a relaxed fit. Engineered to provide the versatility, warmth and comfort of a technical fleece, the Covert Cardigan is an approachable technical jacket with the elegant look of wool. The Covert Cardigan’s modern sweater styling, clean lines and relaxed fit blur the distinction between alpine inspired performance and everyday living needs. Arc’teryx specifically developed Alpenex™ heathered fleece to create a technical jacket with the elegant look of wool. The polyester fabric has a brushed back knit that is engineered to provide versatile warmth and comfort. * Alpenex Heathered™ 100% Polyester. A brushed back knit polyester fabric that looks like a wool sweater, but it is engineered to provide the versatility, warmth and comfort of a technical fleece. Covert Cardigan - Mens is rated 4.0 out of 5 by 18. Rated 1 out of 5 by Simon525 from Nassty new fabric and a peculiar new fit My partner and I have been buying Coverts for years and probably have 8 or 9 in total. We loved them. Sadly the latest Fall '14 version means that we won't be buying them again. The new fabric is horrible - very clingy - such that it is virtually impossible to get your arms into the sleeves. Bring back Polartec! Having said that, the recent Polartec fabrics and Chinese manufacture have brought a notable deterioration in quality. The cut of the new Covert is completely different to that of old - such that it looks like you are wearing a fleece with Dynasty shoulder-pads. What were they thinking of? To use a cliche: Covert has gone from Hero to Zero. Rated 5 out of 5 by Mainah from Excellent garment, great warmth & relaxed fit! This covert cardigan is very warm, serving as a perfect mid layer on cold days, and an outer layer on cool days. It is great for hiking, skiing and other outdoor activities. This cardigan is constructed with impeccable craftsmanship, and is also stylish. The laminated pocket zippers are rugged and should provide for long term wear. A wide range of movement is provided by the relaxed fit. I now have three of these cardigans and would not give them up. I highly recommend this garment for anyone who is serious about outdoor activities, wants to keep warm and is willing to pay the price for quality workmanship. Rated 5 out of 5 by TomH from Comfortable Fleece Jacket Was a little hesitant to buy this jacket after hearing poor reviews of the new fabric material, but was pleasantly surprised when the jacket arrived. I don't know what the material used to be like but I am quite happy with what Arcteryx has done. The material is soft and warm inside while looking quite classy outside. I purchased the Kyanos and it looks great. I go back and forth between M and L for arcteryx products but the M was perfect for me at 188cm and about 78kg. Really nice cut. Its definitely more of a casual use jacket, but could certainly be used for hiking and the backcountry. Rated 4 out of 5 by Will from Nice jacket but quality seems to depend on colour/gender. The men's covert cardigan in olive bought a couple years ago was nice and warm, but unfortunately the version I had the fabric pilled up over much of the jacket, and wasn't what I expected. My wife's women's version in black was much better quality and had no such problems. Not sure if they were manufactured at same time or place. Also, women's gender specific pattern looks so much nicer as it's very form fitting. 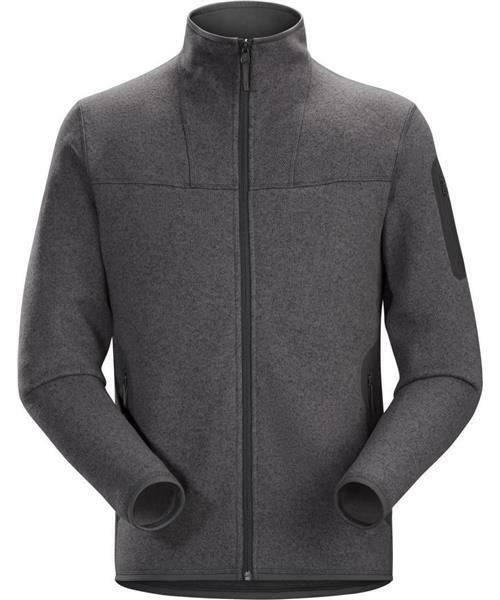 My men's covert crew sweater in black also was perfect and has lasted several years (too bad it's been discontinued, and the closest thing is the covert zip). Rated 5 out of 5 by Jeremy from Great Mid Layer and Casual Jacket I originally bought this jacket as a mid layer when I first switched to a shell outer jacket. However, the discrete bird logo on the arm means that it functions just as well as a casual urban jacket. I think that the Polartec Thermal Pro Knit material is the softest out of all my jackets, which adds to its feeling of warmth. The jacket comes up quite large, when compared to my other medium and small jackets, so a definite try before you buy, if you can. I have the black jacket, mainly due to the very limited number of colours imported into the United Kingdom. Rated 4 out of 5 by Grandy from Really love the pullover sorry that it has been discontinued I own a 6 year old version of the pullover in black and I wear it almost everyday in the winter. I haven't used this as a technical piece, but as an everyday sweater for work and a warm mid layer it has served me very well. The fabric has pilled to a certain degree, but it isn't too bad. I didn't realize that the pullover had discontinued when I purchased a 2nd one this summer, also in black, but now I am glad that I did.